Legacy automaker Ford has a prototype cycling jacket that will make the road safer for cyclists. Ford partnered with cycling clothing specialist LUMO and mobility software experts Tome to create the prototype. The concept jacket features LED lights and vibration motors to help cyclists with navigation. The jacket sleeves light up when a cyclist plans to turn left or right. This helps make hand signals more visible for motorists on the road. Furthermore, the jacket features brake lights that illuminate when stopping. The vibration motors aid the cyclist in navigation. Instead of looking at a phone screen, the jacket can connect to the phone and vibrate the sleeves to tell cyclists when to turn. The jacket’s bike-friendly navigation app powers the feature. The app helps cyclists by navigating them through bike-friendly routes and helping them avoid particularly busy or dangerous intersections. The prototype jacket also features bone-conduction headphones that allow riders to communicate via phone call and receive audio messages without blocking important sounds around them. Ford hopes to enable new features in the jacket. The next planned ideas include hand gestures and voice commands that allow riders to access calls and messages. A group of cycling enthusiasts that work at the Ford Smart Mobility Innovation offices in London, England came up with the idea. The employees test the prototype on their daily cycle commute to the office. Smart clothing like this jacket can definitely go a long way to helping create safer roads. With the chaos of busy streets, cyclists need every advantage to stand out to motorists. 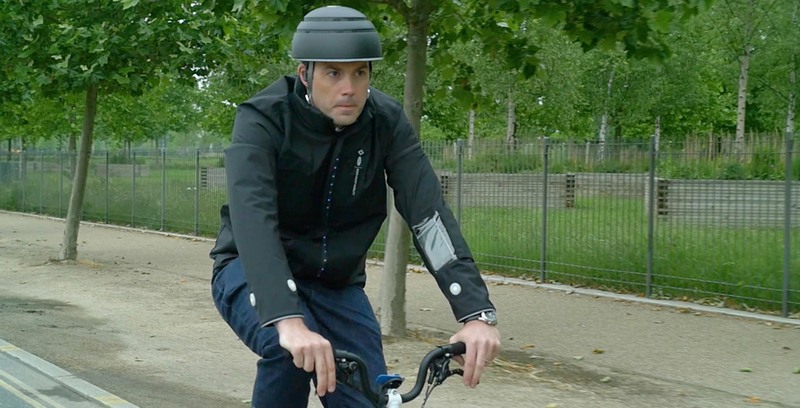 The smart jacket could also help cyclists avoid fines. Quebec recently introduced heftier fines for cyclists using cell phones and also bans using earphones when biking. This jacket could allow cyclists to utilize navigational apps and make phone calls without using their phones, keeping them safe and avoiding fines too. Ford isn’t just switching gears to cycling. The company is also planning to go all in on electric, a marked shift in priorities for the automaker.